A very easy-to-use to help you rip commercial 2D/3D Blu-ray to H.264 M4V format within a few clicks, so that you can playback Blu-ray movie on Apple TV 2/3, iPad, iPhone and Xbox 360. Obviously, blu-ray discs are not supported by Apple TV as it doesn’t own a disc drive. So we choose to rip these Blu-ray discs to Apple TV compatible format, in this case we prefer the H.264 M4V format. Lucky for you, H.264 M4V is also supported by xbox 360 so I guess you can simply finish all the tasks with one hit. Share this page to your Facebook to get 20% OFF. How to convert Blu-ray to Apple TV 2/3 and Xbox 360? 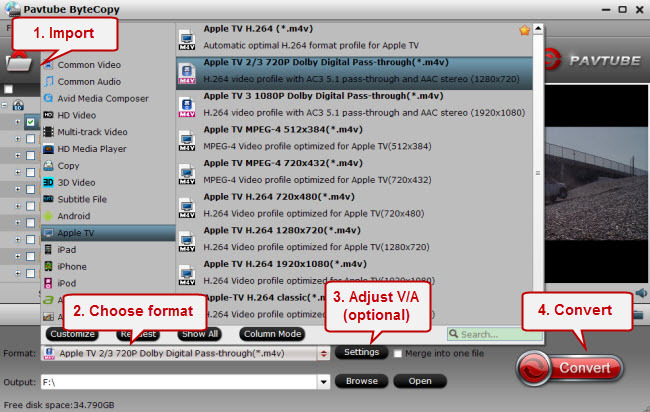 Click “Format” and choose “Apple TV>Apple TV 2/3 720P Dolby Digital Pass-through(*.m4v)” preset as it’s optimized for Apple TV 2/3. Of course you can also play this video on Xbox 360, iPad and iPhone. Click the big “Convert” to start converting Blu-ray to Apple TV 2/3, iPad/iPhone and Xbox 360. After conversion, you can click “Open” to find the converted files. Now transfer your video to iPhone/iPad/Apple TV via iTunes, or use a USB drive to transfer the video to Xbox 360.